3D View-Talk is a 30-minute talk show, which airs Saturdays at 11 am on WADL TV. View past episodes on KissDetroit.com and stay up to date by following the 3D View Facebook page. DML founder Dr. Michele Leno was a guest on Women in Wellness TV with Dr. Gabrielle Pelicci or "Dr. Gabby" as she is affectionately known. As the founder of Women in Wellness Career Training, Dr. Gabby empowers women of all ages to go beyond their limitations and achieve their dreams - reminding them to live their own kind of beautiful life. Stress is a part of everyday life. Enjoy this conversation on how to manage and reduce the stressors in your life! Physical fitness generally grabs the top spot when it comes to ways we want to improve, but why should our mental health rank just as high? With the new year upon us, Dr. Michele Leno discusses ways to make our mental health a priority during this time of resolutions. What would you be doing right now if social media did not exist? There are still some that have not succumbed to the dynamic world of relationship building, sharing, following, messaging, promoting, etc. via social media. But a majority of people (81%!) have at least one social media account. In fact many people have come to prefer this method of interacting over traditional, in person, face-to-face socializing. As a psychologist and social media user, I question the overwhelming fascination with social media. Some of us remember life before social media, though the recollection may be murky at best. READ MORE IN OCTOBER'S NATIONAL PSYCHOLOGIST. Dr. Leno talks about cognitive dissonance with Everyday Health! 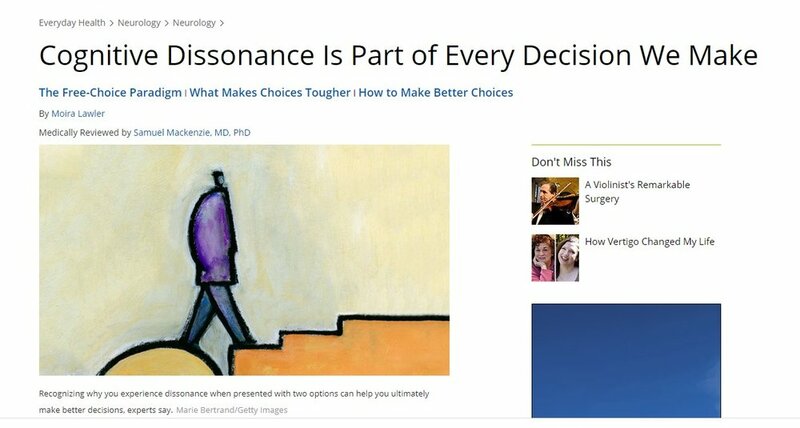 Psychologists call the cognitive dissonance we experience in decision-making the “free-choice paradigm.” When it comes to making decisions, usually we’re not presented with one perfect option, which means we have to weigh one imperfect option against another imperfect option (there are pluses and minuses to both), which creates dissonance. You experience that internal conflict as your brain tries to balance those two (or more) choices, Dr. Leno says. READ MORE IN EVERYDAY HEALTH. Dr. Michele Leno was a guest on an episode of 2Questions.TV hosted by Susan Baroncini-Moe. The show is centered around various topics but only 2 questions are asked to the guests on each episode. Dr. Leno talked about fear and potential, as well as social media and its effects on our mental health. Dr. Leno talks about personality changes and what signs to look out for with Bustle. "It's vital to know the difference between a change in behavior, and a major personality shift. 'Although a person's behavior may change under different circumstances, personality is fairly stable and not easily altered,' Dr. Michele Leno, DML Psychological Services, PLLC, tells Bustle. 'A major shift in personality could represent underlying pathology.' So if you, or the people around you, are noticing a major shift, it's likely worth noting." 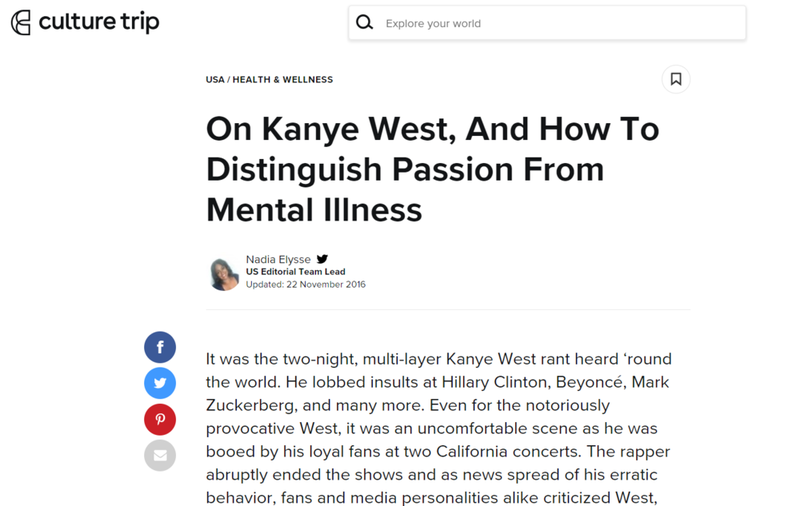 Dr. Leno talks about Kanye West’s controversial comments and how they might be the signs of an emotional problem. “The telltale signs of an emotional problem include extreme grandiosity, impassion accompanied by agitation, lack of sleep that raises concern for friends and family, appearance of not being in contact with reality, and irrational, erratic behavior,” Michigan-based psychologist Dr. Michele Leno told Culture Trip. Dr. Leno talks about how to stop being insecure with yourself and to embrace who you are as a person. “Insecurities are very personal and deeply rooted, and eliminating them requires a great deal of self-awareness. In other words, while people and circumstances may trigger our self-consciousness, we are ultimately responsible for housing and reinforcing our insecurities,” Dr. Leno says. Dr. Michele Leno was a guest on an episode of the Ignite 2 Impact podcast with Dr, Geneva Williams. Dr. Leno talks about recognizing and avoiding the triggers that make people stressed, angry or depressed, as well as how to manage the negative emotions that sometimes flare without warning. Dr. Michele Leno is available for media interviews to discuss psychological concerns, mental health and stress. Dr. Leno is based in the metropolitan Detroit area, but can travel for media. For media inquiries, contact info@dmlpsych.com.